Should You ASSEMBLE Without a Minister? We know you brethren long for local church fellowship. We know you need it. BUT, should you assemble by yourselves without a minister whom God has sent to feed the local flock? THIS YEAR hundreds of new members are being added to God's Church. Many will attend the Feast of Tabernacles this year. They will return filled with the joys of personal fellowship. Soon they begin to visit with nearby brethren. With SOCIAL fellowship comes the inevitable desire to assemble on the Sabbaths for round-table discussions. Many feel the necessity of SOCIAL contact with brethren. They equally desire to learn more about the Bible. What could be better than meeting each Sabbath for Bible study, it is reasoned! And think of the SOCIAL fellowship! Immediately some will think of Hebrews 10:25. "We should assemble ourselves together," they will say. Wherever groups gather together a dominant individual inevitably arises. By force of personality others begin to look to him — even though he may NOT understand the Bible as well as they. He becomes a leader. Yet he may NOT be capable of keeping order. He is usually the center of arguments, doubts and divisions. Dissension and errors gradually arise. Some brethren leave in disgust — soured on the truth. Is this GOD'S WAY of feeding the flock? There are two methods by which we can LEARN the solution to this problem: 1) By New Testament EXAMPLE, 2) by Jesus' INSTRUCTION. First, let us understand the example of the Bible itself. We are experiencing today the same problem which confronted the early, inspired, Spirit-filled Church of God. The apostolic Church was a SCATTERED Church (Acts 11:13). So are you brethren today! But what did that early scattered Church do? Open your Bibles to Acts 11. Notice that some "which were scattered abroad" (verse 19) "came to Antioch... and a great number believed, and turned unto the Lord. Then tidings of these things came unto the ears of the church which was in Jerusalem." What did they do? Notice it! "THEY SENT FORTH BARNABAS, that he should go as far as Antioch" (verses 20-22). Barnabas was a trained teacher (Acts 13:1). Barnabas also sought out Paul (verses 25-26), who had already been trained personally by Jesus Christ (Gal. 3:17-18). They were eminently qualified to feed the flock. Jesus Christ directed His apostles at Jerusalem to send pastors lest the Antioch brethren would assemble without leadership. The SAME example occurs in Acts 14. The apostles, Barnabas and Paul, fled the city of Iconium because of persecution (verses 1-5). They came to Lystra where the Jews soon attacked them as they were conducting their evangelistic work. Thereupon they fled to Derbe (verse 20). In each of these cities the apostles were prevented momentarily from continuing their ministry. They soon returned, however, to confirm the disciples in the faith (verse 21). Now observe verse 23: "And when they had ordained them ELDERS in EVERY church, and had prayed with fasting, they commended them to the Lord." Paul did NOT establish churches without pastors! EVERY local church had its pastor. Jesus called His people sheep. They need a shepherd. Paul therefore gave them pastors, or shepherds, who would feed the flock. We are no different today. God's people still need pastors to lead them into truth. And notice, too, that they were ORDAINED, with prayer and fasting, BY THE APOSTLES. God did not leave it to the brethren to gather together and to follow anyone who had a desire to become an elder. In these cities, where hundreds were being converted. Paul established local churches and ordained elders for EVERY church! But before ordaining elders, Paul's practice was to teach them personally, both in public and in their homes. He said so in Acts 20:17, 20. This is God's pattern — God's WAY. If we are to enter the Kingdom of God, WE must come under the government of God. We must learn to conduct ourselves God's WAY. Christianity is a WAY of life. To many people, a local congregation becomes a place of SOCIAL rather than SPIRITUAL fellowship. People join themselves together, instead of BEING JOINED TO CHRIST. In John 15:5, Jesus said: "I am the vine, ye are the branches." What would you think if the branches would say to themselves, let us bundle ourselves together? Yet that is exactly what you are doing when you meet OF YOUR OWN ACCORD WITHOUT MINISTERS! To be a Christian you need to "abide" in Christ — you need to LIVE by HIS instruction. Do the branches of a grapevine receive their sap from each other? Or do they receive it from the central stump? You need to receive your spiritual power from Christ — the vine. Not from a branch — an individual who thinks he would like to hold a study group on the Sabbath. Your SPIRITUAL fellowship is not merely with one another, but "with the Father, and with His Son Jesus Christ" through the Holy Spirit (I John 1:3). Notice what John writes in verse 6: "If we say that we have fellowship with Him, and WALK IN DARKNESS, we lie, and DO NOT THE TRUTH." If you claim to have real fellowship with God, and "walk in darkness" — disobey the instruction of the Bible — you are not doing the truth. You are actually cut off from real fellowship with the Heavenly Father. "But if we walk in the light" — if we obey the Biblical instruction — "we have fellowship with one another" (verse 7). How plain! In order to have real fellowship with one another, you need to ABIDE in the teachings of Jesus and His apostles — you need to follow the example and the instruction of the Bible, which is ABSOLUTE and FINAL AUTHORITY! Now let us turn once again to Hebrews 10:24-25. What is the PURPOSE of assembling in local churches? "To provoke unto love and to good works... exhorting one another." Notice carefully that Paul explains THE PURPOSE of our assembling, but he DOES NOT EXPLAIN HOW the local assembly should be conducted. To understand THIS, we must turn to other verses which explain this phase fully. In Eph. 4:11-17 Paul explains that Christ gave evangelists, pastors and teachers and other ministerial offices "for the perfecting of the saints... for the edifying of the body of Christ: till we all come in the unity of the faith, and of the knowledge of the Son of God, unto a perfect man... that we henceforth be no more children, tossed to and fro, and carried about with every wind of doctrine, by the slight of men, and cunning craftiness... but speaking the truth in love, may grow up into him in all things." What is the purpose of the ministry? To instruct the brethren to grow in love and in good deeds — exactly as Heb. 10:24 mentions. Then God intends THE PASTORS to set the right example and to instruct the flock which should assemble WITH a minister. IF BRETHREN COULD ACCOMPLISH THIS BY ASSEMBLING WITHOUT A MINISTER, THEN JESUS WASTED HIS TIME TO TRAIN INDIVIDUALS TO BECOME PASTORS OR ELDERS. Then He was mistaken in training the disciples to preach and to feed the flock, if the flock could feed itself! But didn't Jesus promise that wherever two or three brethren gather together, He will be in their midst? The common misapplication of this text comes from careless reading. Christ was discussing with His apostles the matter of making binding decisions in the church (Mat. 18:17). He promises to back every decision — even where only two or three are gathered together IN HIS NAME! What does "in His name" mean? It means "by His authority"! We baptize "in the name of Jesus Christ" — "by His authority." But Jesus never gave authority for His converts to hold meetings by themselves without a pastor! Any who do so are not acting according to Jesus' commands. They are going contrary to Christ's authority. He does not promise to be in their midst. Besides, according to the pattern laid down in Lev. 23:2-4, GOD ORDERS HIS MINISTERS to convoke assemblies — to order meetings. God tells us upon which days we must meet, and He orders His ministers to tell the people when and where He wants the assemblies held. It is God's doing, not man's. Ministers are God's bond-servants and the shepherds of the flock. Now we can also understand clearly other New Testament passages. In writing to Philemon, Paul spoke of "the church in thy house" (Philemon 2). This is not speaking of brethren gathering for discussion groups or Bible studies. It is speaking of a CHURCH — an organized body of saints — over whom Philemon presided. Notice that Paul addressed him as "fellow-laborer" (verse 1). In verse 24 Paul lists "Mark, Aristarchus, Demas, Lucas, my FELLOW-LABORERS." These men were elders and evangelists laboring with Paul in the ministry. Philemon was also a "fellow-laborer" — a minister. Paul even calls him "a partner" (verse 17). The church in his house was NOT without a pastor. Another important consideration many brethren still overlook is that the local church is for the instruction of those who are converted. It is not the PLACE TO CONVERT OUTSIDERS! Yet it seems that some, not understanding this important principle, want to hold sabbath study groups to convert outsiders. And sometimes the unconverted are the very ones who dominate the meeting! Mr. Armstrong has learned by experience that every group needs competent spiritual leadership. It cannot be left to zealous, but unwise, desire to have Christian fellowship. True fellowship comes by OBEDIENCE TO GOD'S WAY. 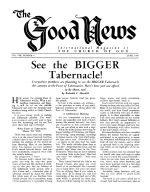 Even though many of you are scattered and have no regular sabbath service, yet be thankful that you are being instructed through two magazines, The PLAIN TRUTH and The GOOD NEWS, and The Ambassador College Correspondence Course. You can hear the daily broadcasts — you actually hear Mr. Armstrong on the radio IN YOUR OWN HOMES! When the "World Tomorrow" Broadcast is on the air, you are attending, in a sense, a church service WITH A MINISTER. This is how God is feeding His flock! Let's realize our blessings and be thankful, no matter where we are. But let's be obedient and doers of God's WAY. He knows best! Instead of murmuring about the lack of trained ministerial help — we are trying our best to train those whom God gives — why not do as Jesus said: "The harvest indeed is plenteous, but the laborers few: PRAY therefore the Lord of the Harvest" — Jesus — "that he send forth laborers into his harvest"! (Luke 10:2). That is your duty, brethren!